The congressional race in PA-6 is either closely competitive or a runaway, depending on who you ask. 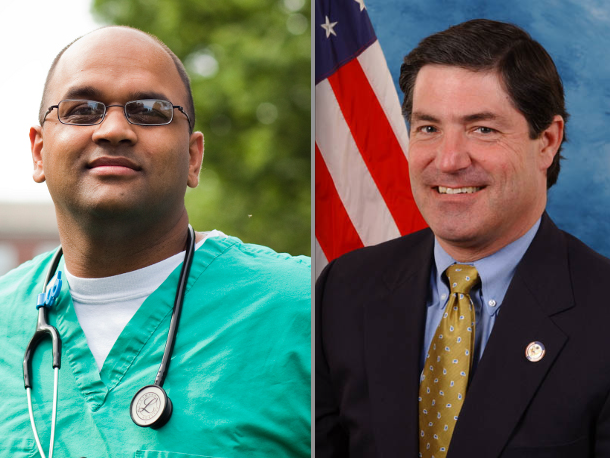 Campaigns of Rep. Jim Gerlach (R-Chester) and Democratic opponent Manan Trivedi each released internal polling numbers that paint very different pictures of the race. Gerlach’s numbers show him up 30 points, Trivedi’s show just a 12 point gap. Gerlach’s numbers show him with a comfortable lead, 55 percent to Trivedi’s 23. That’s based on a live-dial survey of 400 likely voters by WPA Opinion Research. The catch? The poll was conducted back in March. But it’s not the head to heads that Gerlach’s team is focused on, it’s the name ID. “We decided to release the numbers to dispel the false notion coming from our opponent that Jim Gerlach is not known to voters in the new the sixth congressional district and that this is a competitive race,” said Vince Galko, Senior Adviser to Gerlach campaign. One of the biggest X-factors in the race is redistricting. Almost exactly 50 percent of voters are new to Gerlach (and Trivedi, who also challenged the incumbent in 2010). Trivedi’s camp has argued that the large amount of new voters mitigates the fact that the newly-drawn 6th is more Republican. It’s Cook Partisan Voting Index went from D+4 to R+1. The poll shows a very solid 92 percent of constituents have an opinion of the Congressman, compared to just 20 percent who have heard of Trivedi. Not so fast, says Trivedi Senior Adviser Daren Berringer. Their campaign’s polling shows Gerlach leading, but by a far slimmer margin: 45 percent to Trivedi’s 33 percent, with 22% undecided. Trivedi’s campaign didn’t release name ID numbers. Their polling is more recent, from May 21 to 23. Lake Research Partners surveyed 408 likely voters via live dials. After sharing campaign messaging from both sides, which Berringer described as, “simulating a competitive communications environment,” the two were tied at 39 percent. Berringer also noted his opponent’s internal polls in 2010 were far away from the final results. In July and September that year, Gerlach’s campaign released internal polls showing him up 29 and 30 points, respectively. Gerlach beat Trivedi by less than half that: 14 points, 57 to 43. “While it is true that Manan Trivedi has some work to do introducing himself to voters, because our own polling shows Congressman Gerlach’s job approval at a mere 28 percent, it is no wonder he has released yet another of his wild poll results that put him on par with the favorability ratings of Santa Claus,” said Berringer. Based on 2010 election results and the reality of redistricting, it’s surprising that Gerlach would have a 72 point name ID edge on Trivedi. Likewise the Trivedi camp’s assertion that the race boils down to a tie. PoliticsPA recommends internal polling always be taken with a grain of salt. Campaigns release their numbers for a variety of reasons, but typically it’s for one of these two: they want to affect fundraising and perceptions of viability. Campaigns and their pollsters typically share only small bits of information, such as head to head numbers. Rarely are crosstabs and poll questions made public. Politico takes a thorough look the politics of internal polling here. In Gerlach’s case, showing a wide name ID helps to boost his campaign and take oxygen out of Trivedi’s efforts. Trivedi has the opposite goal: he must show that he’s a top tier challenger to continue his steady fundraising. Trivedi has been named to the Democratic Congressional Campaign Committee’s Red to Blue list, putting him among the top few dozen challengers in the country and in the top three in Pennsylvania. At the end of the first fundraising quarter, Gerlach enjoyed a nearly 2 to 1 cash advantage: $688,000 on hand to Trivedi’s $355,000. Gerlach has served in Congress since his election in 2002, frequently defeating well-funded Democratic challengers. Prior to that, he served in the PA Senate. Trivedi is a physician from the Reading area. Before challenging Gerlach in 2010, he served as a combat surgeon in Iraq. Really, really funny stuff. Trivedi thinks a twelve point loss would be as good as a win? He’ll have to raise some serious independent funds before the party will even begin to consider him viable — and considering their House minority position, the electoral map and the odds here, they may never even look at Trivedi. Touting numbers like these in a newly configured district, even if they weren’t dubious, won’t create a blip on the DNCC radar.